During the rendezvous between the space shuttle Atlantis and the Hubble Space Telescope, and thereafter, while seven astronauts replaced six gyroscopes, batteries, and a sensor used to guide the telescope, a Schneider Cinegon 1.8/16mm lens, a Schneider Xenoplan 1.4/23mm lens, and a Schneider Xenoplan 1.9/35mm lens were the eyes of the cameras that delivered high resolution images to the shuttle and to engineers on earth, to ensure engineering support for the astronauts. We are especially pleased to have had standard Schneider lenses chosen for this important mission, as it illustrates their highly robust quality as well as their incredible high-resolution capabilities. Schneider Optics, a worldwide market leader in high-quality lenses for industrial applications, has just announced that their Schneider C-mount Xenoplan and Cinegon lenses were selected by NASA to play an important role in the recent servicing in orbit of the Hubble Space Telescope. According to NASA, "the quality and robustness of Schneider lenses were decisive for the space mission." During the rendezvous between the shuttle Atlantis and the Hubble Space Telescope, and thereafter, while seven astronauts replaced six gyroscopes, batteries, and a sensor used to guide the telescope, the Schneider lenses were the eyes of the cameras that delivered high resolution images to the shuttle and to engineers on earth. "We are especially pleased to have had standard Schneider lenses chosen for this important mission, as it illustrates their highly robust quality as well as their incredible high-resolution capabilities." said Schneider Vice President, Stuart Singer. "Everyone at Schneider is thrilled to have made a contribution to the historic in-space service mission that is likely to enable the Hubble Space Telescope to continue functioning until at least 2014." Mounted in the shuttle's payload bay, the three Schneider lenses were able to cope with even the most severe conditions encountered during launch, without the need for modifications of any kind. On earth, these lenses are typically used for 3D measurements in scientific and industrial applications, including advanced robotic vision, machine vision, metrology, and all kinds of visual inspection systems where high reliability and precision are essential. Schneider Xenoplan and Cinegon compact C-mount lenses feature precision irises having the popular Schneider locking mechanism. This improves control of grey-scale calibration, F-Stops and a wide magnification range. 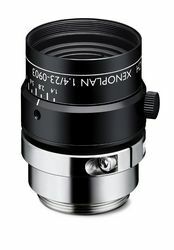 A unique focus mechanism enables very fine focus adjustment and locking without backlash, and a broad range of filters can be accomodated. The Hubble Space Telescope service program is not the first time NASA has relied on Schneider lenses to help accomplish an important space mission. In 2006, during NASA's successful STS-121 mission, the Discovery Space Shuttle utilized a Schneider Xenoplan Compact C-Mount lens on its orbital inspection boom HD camera, to scan the orbiter's exterior for damage while in orbit. The Schneider Group, founded in 1913 in Bad Kreuznach, Germany, is a worldwide market leader in high quality lenses for industrial applications, photographic lenses, filters, cinema projection lenses and optical accessories. In total, Schneider has manufactured more than 15 million lenses and has created thousands of optical designs. The Schneider Group has 600 employees worldwide. It's Industrial Optics Business Unit designs, develops, manufactures and markets optical and opto mechanical components and subassemblies for machine vision and other image processing applications. By providing high quality optical solutions, Schneider helps system integrators and equipment manufacturers to enhance their vision systems. For more information contact Schneider Optics, Inc., 7701 Haskell Avenue, Van Nuys, CA, 91406-1906; TEL: +1 818 766-3715 or visit http://www.schneideroptics.com. To contact Jim Sullivan directly, ask for x116. To discuss your consulting requirements directly with Stuart Singer, call +1 631 761-5000 x204.